Cupcakes 'n Daisies: Day 4 - of the 4th of July Blog Tour . . . .
First up, I think I've found my pattern for my bundle of Countdown to Christmas by Sweetwater for Moda! Starry eyed by Angela from Fussy Cut!! Better yet, it's a free pattern from the Moda Bake Shop! There are several things I like about this pattern, the wonky floating stars that keep you from losing points, the block sizes that showcase the cute print in the fabric, and just the overall fresh feel to it. The blocks are huge to me, 16 inches, normally I don't like anything larger than 9, but I like these blocks. Additionally I normally don't make quilts using the same fabric as the pattern, I don't like having the same quilt as tons of other quilters, but I can't think of anyway to improve on this pattern, I think this may be a perfect fit of fabric and pattern, who am I to try to improve on perfection. Ginger, thanks so much for the suggestion and link to this pattern, I really need to check out that Moda Bake Shop on a regular basis. For now this is my pattern, stay tuned to see if another catches my eye between now and December. Now, on to some more starry business . . .
and here's what I've made. The star blocks are 3 inches finished. There are so many show quilts I want to work into my tribute quilt that I've realized I need to make smaller and partial versions of most of them. I left some leeway around my outer edge to trim this quilt down to whatever size works when I'm ready to put all the little quilts together. This little piece of the puzzle finished at around 20" x 24" and has 326 pieces. So here's where I am right now, plenty of work to go. Between these three projects I'm now up to 1,189 pieces. Each little quilt feels like it's own project so I'm enjoying each leg of this journey. And it doesn't look anything like what I have in my mind's eye, but I'm not worried about it. . . . yet! Sherri at A Quilting Life. Tomorrow is my blog tour day, be sure to stop back by!! I love the starry eyed pattern - I like the way the two different types of framed blocks are different sizes, it really adds interest to the quilt. Your red and white mini quilts are fabulous - can't wait to see more in the future! I was just looking at the Starry Eyed pattern yesterday -- I have it in my favorites -- and thinking about making it. Another "maybe someday". I sure do love what you're doing with the red and white quilts! Wish I could have seen the exhibit. Your red & white inspiration quilt is just wonderful! I really like the Moda Bake Shop pattern too. I absolutely love your red and white. I am anxious to see each new step! I am so in love with your tribute quilt and the fun of watching it evolve. It will be amazing. Love Moda Bake Shop, too... but your red and white!!! Oh, MY!! I agree that this quilt might make me want to make ANOTHER Christmasy quilt. I about swore off of them after finishing up Christmas Star last year. I've decided to turn my red/white blocks into a table runner--really whimping out here, I know, but I already have a red/white quilt that I love. I think it would be fun to see these six blocks on holidays: Christmas and patriotic! Love the star quilts. The red and white is awesome. I love that Moda bake shop project. I have it marked and saved for a future project. Love your rd and white quilt progress. Love that Moda Bake Shop project. So crisp and sharp looking. A favorite. Love seeing the progress of your red and white quilt. I really like the Moda Bake Shop quilt! It is gorgeous. 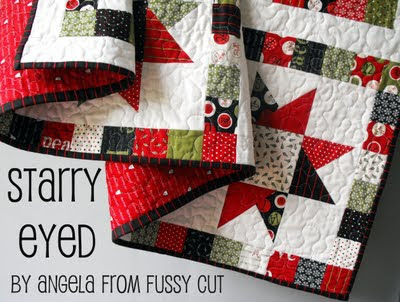 Your red and white quilt is going to be fabulous! I can't wait to see more! Your tribute quilt looks wonderful...and the Moda Bake shop one is very nice too...I love their patterns...some great things in there! This red-and-white tribute quilt is progressing nicely. I still can't believe you are doing those little tiny intricate blocks! They are superb!